According to long-time memorabilia collectors, the market for genuine vintage memorabilia has changed dramatically over the last decade. In the late 1980s, the market consisted of a very limited supply of genuine articles (e.g., vintage balls, checks, old books, letters, and the rare cut). These items were almost exclusively traded among a select group of collectors through a well-defined network. However, the market is literally flooded with tens of thousands of vintage items (including bats, balls, jerseys, helmets, pictures, magazines, pieces of papers, posters, lithographs, record albums, and other items) that are simply counterfeit. During the 1990s, the FBI identified a major problem threatening the entire sports and celebrity memorabilia market. The Chicago Division of the FBI initiated a sports memorabilia fraud investigation targeting a group of individuals who forged, fraudulently authenticated, and distributed Chicago athletes' autographed memorabilia (including that of Michael Jordan). To date, this case has resulted in the conviction of 14 individuals in five states (Illinois, California, New Jersey, Massachusetts, and Minnesota) involved with forging and distributing forged memorabilia. Information developed by the Chicago FBI's "Foul Ball" investigation suggested that the problem might be national in scope. While it is impossible to definitely estimate the percentage of forged memorabilia, most industry experts concede that over half of the autographed memorabilia is forged. In fact, some cooperating subjects and memorabilia experts believe that up to 90 percent of the memorabilia on the market is forged. Industry experts estimate that the autographed memorabilia market in the United States is approximately $1 billion per year. Using these estimates, forged memorabilia comprises between $500,000,000 and $900,000,000 of the market. In 1997, the government devised an undercover scenario in which an undercover agent would pose as a distributor of American memorabilia in Asia. This scenario enabled the FBI to purchase evidence without being forced to sell forged items to the public. It also made the criminals more likely to openly discuss the counterfeit nature of the memorabilia because it was "going overseas" beyond the reach of U. S. law enforcement agencies. To support this "cover story," the FBI established the Nihon Trading Company in Oceanside, California. The goal of the undercover operation was to infiltrate the forged memorabilia market and obtain recorded statements from those individuals who were identified as forgers, authenticators, and distributors of fraudulent memorabilia. The key evidence in this investigation were recorded statements that captured the individuals knowing involvement in forging, fraudulently authenticating, and/or distributing forged memorabilia. The San Diego Division of the FBI conducted a total of more than 1,000 consensually recorded audio and videotapes. During the consensually recorded conversations, numerous co-conspirators made incriminating statements that illuminate the nature and common practices involved with sports memorabilia fraud. For example, one of the conspirators joked to the undercover agent about how Mickey Mantle still has one arm out of the grave doing autographs. Other conspirators noted that Wilt Chamberlin was still available for signing weeks after his death. During the investigation, various conspirators became suspicious of a law enforcement investigation and scheduled a breakfast meeting at a restaurant in Carlsbad, California. The conspirators discussed how to avoid law enforcement detection, attempted to identify individuals who might cooperate with law enforcement, and developed a strategy of not talking if confronted by law enforcement. Several agents having breakfast at adjacent tables overheard all of these statements. On October 13, 1999, based upon an extensive amount of evidence, special agents of the FBI and the Internal Revenue Service executed approximately 60 search warrants at residences and businesses in five states, including California, New Jersey, Nevada, Pennsylvania, and Florida. Over 400 special agents were involved in the operation. The evidence seized during this investigation was stored in a 10,000 square foot warehouse. To date, Operation Bullpen has accomplished a wide variety of objectives. One of the most significant accomplishments is the infiltration and dismantling of a major nationwide network of forgers, authenticators, wholesalers, and retailers. This organization is responsible for the creation and sale of up to $100 million of forged memorabilia. This network distributed forged memorabilia directly to retailers in 15 states including California, Nevada, Arizona, Oregon, Hawaii, Kansas, Illinois, Florida, Georgia, Tennessee, South Carolina, New Jersey, New York, Massachusetts, and Pennsylvania. In addition, the wholesalers sold forged memorabilia to retail businesses and consumers in virtually every state in the country. 4. Reno Ruberti - Wholesaler, d.b.a. 5. David Tabb* Forger, Wholesaler, and Authenticator, d.b.a. 7. Mike Lopez - Forger and Wholesaler, d.b.a. 8. Mike Bowler - Distributor and Wholesaler, d.b.a. 9. Ricky Weimer - Wholesaler, d.b.a. 10. Sheldon Jaffe - Wholesaler, d.b.a. 11. Richard Laughlin - Wholesaler, d.b.a. 12. Michael Tapales - Wholesaler and "Runner", d.b.a. 13. Carmen "Chip" Lombardo - Wholesaler, d.b.a. 14. Jon Hall - Retailer, d.b.a. 15. Lowell Katz - Retailer, d.b.a. 16. Bruce Gaston - Retailer, d.b.a. 17. Frosty Golembeske - Retailer, Wholesaler, d.b.a. 18. Anthony Marino - Wholesaler d. b. a. 19. Scott Harris - Wholesaler, d. b. a. The government's investigation in San Diego is continuing, and it is anticipated that many others will be charged with fraud and tax evasion. In addition to charging all those responsible with fraud and tax offenses, the FBI and the IRS - Criminal Investigation Division are seizing assets, assessing fines, and determining tax liability. The seized assets include two homes with a combined value of approximately $1,000,000; a 38-foot boat valued at $34,000; jewelry worth approximately $56,000; a Ferrari; a Harley Davidson Sportster; and cash or fines totaling over $1,000,000. Perhaps the most important objective of this investigation is to increase public awareness regarding the substantial memorabilia fraud problem that may account for upwards of $500,000,000 in losses annually. While there are legitimate and reputable companies selling authentic memorabilia, the industry has been plagued with high-quality forgeries making it difficult for legitimate companies to compete. It also defrauds thousands of unsuspecting consumers each year. While the only way to absolutely guarantee that the autographed memorabilia is authentic is to personally witness the autograph, there are several ways to avoid becoming a memorabilia fraud victim. 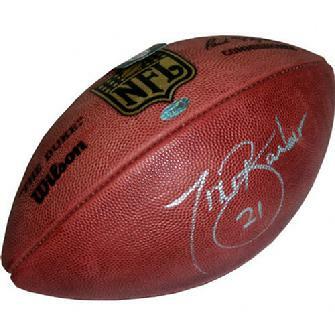 The method of selling the memorabilia should not affect skepticism about the item�s authenticity. The investigation revealed that forged memorabilia traffickers sell their forgeries through a variety of methods that may lend credibility to the forgeries. One such sales method is through charity auctions in which the trafficker splits the profits with the charity. At charity auctions, buyers often overpay for items and do not question the authenticity of the memorabilia. Traffickers also sell forged items through trade publications, television shopping networks, trade shows, retail businesses, and the Internet. Those who believe they can quietly buy and sell non-genuine merchandise on eBay and get away with it might want to check in with an eastern Pennsylvania man who could be facing a long prison sentence. The U.S. Attorney's office has filed an indictment against Forrest R. Smith III of Reading. Smith is charged with three counts of wire fraud and one count of mail fraud. The indictment alleges that Smith forged the signatures of famous authors in copies of their books and then sold those books at inflated prices on eBay. The government's charges show Smith accused of selling his items to over 400 different unsuspecting buyers between 2002 and December 15 of last month. Smith took in more than $300,000 from the sales. Smith created and used two different eBay accounts to carry out his fraudulent scheme: one registered in his name with the user identification of �bigdaddy_books,� and one registered in his wife�s name with the user identification of �bev103162smith.� According to the indictment, Smith used the �bigdaddy_books� account to purchase unsigned books, then forged authors� signatures in them and re-sold them as �signed� from the �bev103162smith� account. He was able to carry out the scheme, in part, because he had obtained documents containing authentic signatures of each author and had ink-based stamps made for the signatures. The indictment alleges that Smith then used those ink-based stamps to place the false signatures in the books he sold on eBay. Smith allegedly forged autographs of deceased writers including Michael Crichton, James Michener, Norman Mailer, Leon Uris and Kurt Vonnegut, and living authors John Irving and Tom Wolfe. Sports collectors have seen the same type of scam take place online with sellers faking not only autographs, but wax packs. A seller will buy large quantities of vintage wax pack wrappers, using them to create 'packs' they list as 'unopened'. The packs, filled with commons or low value cards, often sell to naive buyers for a hefty profit. Sometimes the sellers are brazen enough not to bother creating separate eBay IDs, buying the wrappers and selling vintage packs within weeks of each other. Shipping fraudulent merchandise through the U.S. Postal Service is a felony. �The U.S. Postal Inspection Service is committed to protecting the public�s full confidence in the U.S. mail system by actively pursuing individuals seeking to use the U.S. mail in furtherance of any scheme devised to defraud the public,� said U.S. Postal Inspector-in-Charge Teresa Thome of the Philadelphia Division. If convicted of all charges, Smith faces a maximum possible sentence of 80 years imprisonment, a $1million fine, 12 years of supervised release, a $400 statutory assessment, and restitution. The case was investigated by the United States Postal Inspection Service and is being prosecuted by Assistant United States Attorney Mark B. Dubnoff. This is No Bull ! Each Monday morning FBI agent Bob Walker trades his uniform�white dress shirt, dark suit and 10-mm Smith & Wesson�for a T-shirt and jeans. For four hours, at an FBI storage facility in Chicago, he becomes the antifan, defacing boxloads of pricey sports memorabilia. Walker sprays paint over Michael Jordan's signature on a basketball. He uses an industrial-strength solvent to remove Dan Marino's name from a football. He covers Anfernee Hardaway's autograph with indelible ink. For the final touch Walker applies a stamp�FBI OPERATION FOULBALL, FORGERY�that identifies each item as seized contraband. The FBI is completing the initial phase of Operation Foulball, the first federal crackdown on counterfeit sports memorabilia. This summer, in U.S. district court in Chicago, six men who operated a forgery ring were given sentences of 18� months in prison to four years of probation for bilking collectors out of as much as $5 million. Over the past decade sales of sports memorabilia have risen to an estimated $3 billion a year, and fraud has grown exponentially. Agents across the country are engaged in investigations of forgery rings, but so far the case in Chicago has been the most significant. "I do not think any of us expected this was going to be as large as it is," says Mike Bassett, the FBI agent who broke the case. Bassett's interest was first piqued by a 1994 phone call from a collector who had acquired a game-used, autographed Frank Thomas glove and had been nagged by doubts about its authenticity. Pursuing the tip, Bassett and his partner, Walker, eventually nabbed a Chicago sports-collectibles dealer named Anthony Alyinovich. From 1994 through '96, Alyinovich led a conspiracy to make and sell bogus sports memorabilia: jerseys, bats, balls and photographs bearing the forged autographs of professional athletes. Alyinovich, 31, has admitted that during one five-week period last year he distributed more than 1,700 items of forged memorabilia. Half the fake memorabilia the FBI has confiscated is allegedly "signed" by Michael Jordan, who rarely gives autographs. When the federal investigation began, agents and prosecutors interviewed a number of stars�including Jordan, Dennis Rodman and Scottie Pippen of the Chicago Bulls; Shawn Kemp, then with the Seattle SuperSonics and now with the Cleveland Cavaliers; and Frank Thomas of the Chicago White Sox�about their signing practices. Each athlete said he hadn't signed the pieces in question and expressed outrage about the forgeries. Those conversations confirmed the suspicions of assistant U.S. attorneys Joel Bertocchi and David Rosenbloom, who then obtained search warrants and wiretaps that would help them arrest the producers of the fraudulent memorabilia. Bassett and Walker staked out sporting-goods stores around Chicago. They discovered, among other things, a run on size-13 Air Jordan basketball shoes, the ones Jordan himself presumably would use and then autograph. With the help of store owners the agents marked merchandise to enable them to trace the flow of raw material among the counterfeiters. Armed with a search warrant, they then visited Federal Express offices to open packages shipped by the forgery suspects and inspect marked goods that now bore bogus signatures. They resealed the containers and allowed them to be delivered. Wiretaps and concealed cameras in a Chicago warehouse recorded the forgers' conversations and actions. On the wall of the rented warehouse the counterfeiters posted a chart designating who was responsible for each Bull's signature. Kevin Walsh of Chicago forged the names of six players, and Jon Schwartz of Des Plaines, Ill., signed for the remaining six. Schwartz and Walsh charged Alyinovich fees ranging from $5 per signature on a photograph to $50 for the autograph on a Jordan jersey. The jersey might fetch as much as $1,000 from an unsuspecting fan. On request, Alyinovich donated forged sports memorabilia to charities that he knew would unwittingly market the material as genuine. (Buyers at charity events are often willing to pay top dollar.) The conspirators even attempted to con one another. To create a patina of legitimacy, the forgers issued bogus certificates of authenticity. Stories were concocted to explain the merchandise's origins. Conspirators talked of having paid "hawkers" to obtain signatures outside arenas, hotels and other public places. More often they boasted of contacts who knew someone close to the athletes.